The below artworks are the most important in Nouveau Réalisme - that both overview the major ideas of the movement, and highlight the greatest achievements by each artist in Nouveau Réalisme. Don't forget to visit the artist overview pages of the artists that interest you. Artwork description & Analysis: Between 1955 and his death in 1962, Yves Klein produced 194 "monochromes," or canvases painted with a single color. The technique of painting the entire canvas with a block of color challenged expectations of what the content of a painting should be. His literal depiction of colors as their real selves with unadorned simplicity, lacking of line, image or intention, was his way of opening art to extended possibilities. It also acted as an antidote to the dominant style of Abstract Expressionism, which championed the lyrical expression of paint as being conjured through an artist's pure emotion. Instead, paint could be used as a tool to invest a space with sensibility, rather than meaning. In the beginning, Klein's monochromes came in multi-colors, but at one particular show he was disheartened by the audience's propensity to try, and divine relationships between the paintings of different color so he eventually settled on a specific hue of blue to convey his point. He said of his choice of color, "blue has no dimension, it is outside dimension, while the other colors do have one. [...] All the colors bring associations of concrete ideas [...] while blue at the most brings to mind the sea and the sky, already the most abstract things in tangible and visible nature." In order to create this distinctive color, Klein worked with a chemist to create a precise, patented, signature hue; it was named, and is still recognized worldwide today, as International Klein Blue. His blue paintings became invitations to infinity; in fact, he compared one of them to an "open window to freedom." Artwork description & Analysis: In 1961, Niki de Saint Phalle (one of the few female artists associated with Nouveau Réalisme) held an exhibition at Galerie J entitled Fire at Will. 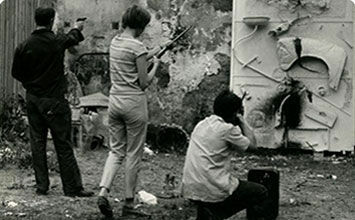 On show were several of her "Shooting Pictures" from her series Tirs, which means gunshot or fire in French. In these pieces, polythene bags of paint were fixed to a board and covered with thick plaster. Viewers were then invited to shoot a rifle at the surface, popping the bags and causing the paint to run down the textured white surface. This particular work was shot at by a number of people, including American artists Jasper Johns and Robert Rauschenberg. The process of creating the artwork within the public eye, and asking others to join in, became a collaborative performance, which dissolved traditional stereotypes of the artist as a solitary hermit-like figure and opened up art's reach toward the populous. This mirrored the Nouveau Réaliste mission of staying loyal to reality rather than designating it with construed hierarchical values. It also allowed for the final product to become one of chance, proving that art could be as spontaneous as it can be strategic. Critic Craig Staff interprets the aggressive nature of these shooting pictures as representing the death of traditional painting as a medium. He claims "it is difficult not to interpret Saint Phalle's 'shooting paintings' iconoclastically and within a set of terms that unequivocally sought to negate, if not entirely bring down, the medium." After a couple of years, Saint Phalle stopped making these works, claiming she had become "addicted to shooting, like one becomes addicted to a drug." Artwork description & Analysis: Tinguely's Baluba series, executed from 1961-1963, were wildly provocative odes to the detritus of consumer culture. The sculptures were created from a variety of found objects in compositions that radiate disharmony while also promoting the beauty of fragility. Most of the objects are scruffy and old, and are used as a pointed comment on society's promotion of brand new objects. Tinguely considered each piece a living entity and was pleased at his ability to present dark commentary on mass production and the industrialization of society through such humorous means. This piece exists as a parody of traditional sculpture, composed with an industrial oil drum as a plinth, rising to a collection of objects delicately balanced at the top. This work is also kinetic, following in the tradition of Naum Gabo and Alexander Calder. The viewer can press a pedal beside the work to activate a motor, which causes the sculpture to move and shake. The Centre Georges Pompidou describes the effect: "what seemed incomplete and unsatisfying when motionless, when animated becomes a bizarre enchantment of sorts." It is interesting to note that the Baluba pieces oftentimes contained colorful feathers, inspired by his relationship with fellow Nouveau Réaliste Niki de Saint Phalle, who he would later marry. Artwork description & Analysis: This work was created for an exhibition in 1962 entitled "Musical Rage." It is one of a collection of pieces/happenings known as Rages in which Arman carried out acts of vandalism in public. At the opening, he used a sledgehammer to smash up a piano, before affixing the pieces in an abstract organization onto panel. The character of the finished piece was determined by the unique forms, created by the destroyed instrument, giving the piece a decidedly Cubist or Baroque bent. This process of destruction and transformation became a performance in itself. However, as critic Jan van der Marck points out, "the action was secondary, and what interested Arman was the result." Critic Alfred Pacquement further argues that "Arman's ill-treatment of objects [...] was due less to a systematically destructive will than to a desire to provoke new aesthetic effects." The final piece presents a record of an experience and also proffers a new approach to making. It is an assemblage piece in the spirit of Dadaist techniques as well as typical of Nouveau Réalisme. Artwork description & Analysis: Ricard demonstrates César pushing the boundaries of assemblage and using a destructive process to create an artwork. It is one of a series of similar works, in which he used a scrap metal press to compress retired cars into shapes that predated Minimalist sculpture by a few years. He was interested in compression as a concept, and in the relationship between an object's proportions and its outward appearance. He came up with the idea of "manipulated compression" in 1961, and used it to explore how viewer's assumptions about an object could be challenged through changing its proportions and the appearance of its external skin. Through a series of experiments, César discovered how to crush the metal in order to get the dimensions, form and color he wanted. Through this ability to predict what his sculptures would look like, he added a personal dimension to an impersonal industrial process. These works furthered the Nouveau Réaliste dialogue on commodity by not only appropriating real discarded automobiles but also, by literally appropriating the technological process used to destruct them. The mastery of this compression process led César to create a small parallelepiped sculpture that remains the César Award, or the highest film honor trophy in France. Artwork description & Analysis: This work resulted from an exhibition called 723 Kitchen Utensils, which took place in Paris in 1963. Spoerri transformed Galerie J into a restaurant and cooked food to be served by art critics to visitors - creating an innovative demonstration of the relationship between artist, critic, and consumer. Once they had finished, visitors were encouraged to create "snare pictures," meant to depict a singular moment in time, which a viewer might stumble upon in all its disordered reality. Spoerri would then present the board on the wall, pushing the boundaries between pictorial and sculptural art in a way that jostled one's perception and normal mode of seeing. Art historian Manfred Schneckenburger claims that these works demonstrate a "strong touch of post-Surrealist unreality", and describes them as "an equation of our sensual, vital, untidy, dirty world, and [...] a quest for evidence of what Spoerri had described as 'one split second in an entire cycle of life and death, decay and rebirth'." In fact, the "snare pictures" can be seen as physical Polaroids of actual existential moments, absent of sentimentality. Artwork description & Analysis: Taking his cue from Dadaist and surrealist collage works, Rotella created images in the important technique developed by the Nouveaux Réalistes called "décollage". His art was inspired by the shredded or peeling movie posters spotted on the streets of Rome. He later said, "I was literally spellbound, and even more so because at that time I was convinced that painting was finished, that something new had to be unearthed, something alive and modern. So in the evenings I began to tear the posters, ripping them from the walls, and take them back to my studio, creating compositions." Marilyn was created by gluing together several layers of posters and advertising images before Rotella tore strips away to reveal the different layers beneath. A powerful visual effect is thus created by the juxtaposition of the famous and iconic actress, who was the subject of so many Pop artworks, with the casual brutality of the ripped surfaces. John-Paul Stodart describes this work as summing up a "conflict between the old and new worlds" of post-War Europe, and as "revealing quite literally the underside of consumer dreams." First published on 17 Feb 2017. Updated and modified regularly.